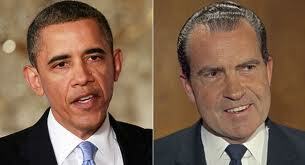 Richard Nixon and Barack Obama are rarely compared. But the way these two presidents have dealt with crises in the Middle East provides instructive contrasts on the nature of leadership. This summer marks the 40th anniversary of the resignation of President Nixon, a man more associated with skullduggery than leadership. But in October 1973, when his Vice President was resigning in disgrace and the congressional investigation into his own misconduct was moving to its fatal conclusion, Nixon demonstrated how a leader can take command, master events, and shape history. President Obama has not abandoned Israel, nor has he declared himself neutral in its current struggle against Hamas. But time after time, he has undercut Israel’s position, in an effort to curry favor with a hostile world. Most disturbing, Obama’s White House has recently changed the military-to-military relationship by which American weaponry has been transferred to Israel, to require White House and State Department approval. Now these are U.S. weapons, and it is of course up to the U.S. government to set the protocols for their transfer. But to change the rules so abruptly, while Israel is under daily bombardment, is unprecedented. We have many, many friends around the world. The United States is their strongest friend,” the official said. “The notion that they are playing the United States, or that they’re manipulating us publicly, completely miscalculates their place in the world. In other words, the administration was telling Israel by these leaked remarks: We have many friends. You do not. Don’t ever forget it. Sniping at friends to placate their enemies is not leadership. It is not even shrewdness. The United States has won no new friends from undercutting Israel. To see a different kind of leadership, travel back in time and consider the performance of Richard Nixon in October 1973. Israel faced a military crisis. Egypt and Syria, backed by nine Arab states and lavishly supplied by the Soviet Union, attacked on Yom Kippur. Israeli forces were thrown back in the Sinai and on the Golan Heights. Defense Minister Moshe Dayan told Prime Minister Golda Meir that Israel faced imminent defeat. The situation was so dire, that the Israeli government considered resorting to a last ditch nuclear option. In this crisis situation, Richard Nixon ordered a massive airlift of military supplies to Israel. During a 32-day period beginning October 14, jumbo U.S. military aircraft touched down in Israel 567 times, delivering some 22,300 tons of material. Conducting such an operation was a complicated task. Then, as now, Israel was not popular on the international scene. Fearful of the Arabs’ oil weapon, NATO allies refused to allow U.S. transport planes to refuel in their countries – even while NATO members Turkey and Greece were allowing Soviet supply planes to overfly their territory. Ultimately, the U.S. managed to pressure Portugal to allow landing in the Azores for refueling. The airlift helped turn the tide. Egyptian President Anwar Sadat proposed a ceasefire enforced by Soviet and U.S. troops on the ground. The U.S. rejected the proposal. Soviet leader Brezhnev then threatened to send Russian troops to the Middle East unilaterally. Nixon ordered that U.S. military to be put on high alert. Air Force strike units were prepared for attack, and two aircraft carriers were deployed to the Eastern Mediterranean. Brezhnev backed down. Richard Nixon neither sought nor received any political gain for his decisive leadership. The Watergate investigation intensified, culminating in his resignation ten months later. American Jews, who voted overwhelmingly for Humphrey in 1968 and McGovern in 1972, remained, and remain today, hostile to the man. It is also doubtful that friends of the United States in other parts of the globe will remember him that way. When Iranian populists remember Obama, they are likely to remember him as the President who reached out to the regime’s theocratic dictators, but failed to support the courageous demonstrators of the Green Revolution. When the Poles and Czechs remember Obama, they are likely to recall him as the President who reneged on the promise to build a missile defense shield in Europe, to avoid irritating the Russians. When Ukrainians remember Obama, they are likely to recall him as the President who, after the non-irritated Russians annexed the Crimea, responded by airlifting, not weapons, but 300,000 ready-to-eat meals. The irony of leadership is that it often proves a more effective tool to win over foes than supplication. Obama’s forbearance has won the United States no points from Russia or Iran, or any of our other opponents. It has only disappointed our friends. In contrast, Richard Nixon steadfastly supported Israel during wartime – and was lionized by Egyptians in the aftermath of that war after brokering a ceasefire. Since the 6th of October, and since the change that took place in the American foreign policy, peace is now available in the area. And President Nixon never gave a word and didn’t fulfill it; he has fulfilled every word he gave. Richard Nixon was a man of many flaws, not least of which was a strong strain of anti-Semitism. But he was also a leader. The current President, driven to make America liked again, may have more charity in his heart, but he has far less spinal fluid in his backbone. Interesting. However, concerning Obama’s reneging on a promise to build a missile defense in Poland and Czech Republic, Wikipedia says. Trusting a person of Obama’s limited experience, shadowy past, and lack of accomplishment with the job of POTUS was the equivalent of promoting an entry level cash-register clerk to CEO of WalMart without doing any background checks. It’s Chauncey Gardener. It would never happen in the real world or without media collusion in a building a big fairy tale of hopey-changey nonsense. Anyone who thought a person with that background would have any leadership capability or relevant experience was deluded, gullible, or totally uninformed. If you knew who he really was in 2007-08, his job performance is completely predictable.